Do your travels call for a roller or a backpack? With hide-away, air mesh shoulder straps, the answer doesn't matter with this hybrid upright. The lightweight, durable fabric is water-resistant for a first line of weather defence. Hide-away backpack straps allow for quick and easy shouldering; the wheels face away from your body when in use as a backpack to allow a clean, comfortable carrying experience. The durable exoskeleton and the molded polypropylene back panel absorb the impact of rugged travel and tough, oversized wheels and Thule V-Tubing telescoping handles guarantee a smooth, steady and straight pull for many years. 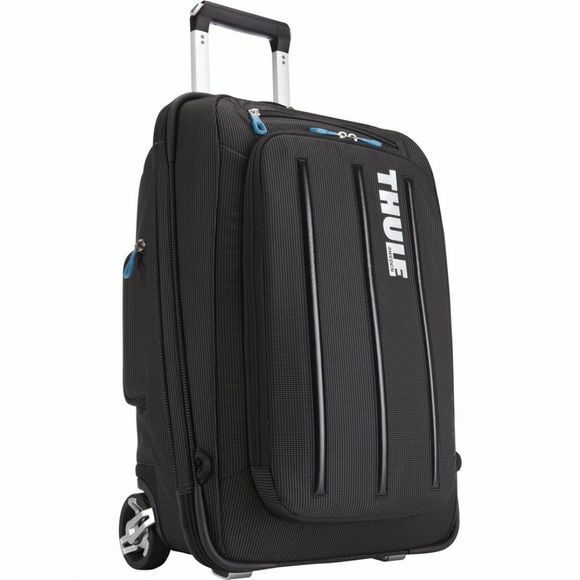 Thule was established in Sweden in 1942. And ever since then, we’ve made it our business to bring you closer to the world and your passion for life. We are an international group of people united by our own passion for helping active families and outdoor enthusiasts. Thule helps you transport anything you care for safely, easily and in style so that you are free to live your active life. We believe in the value of an active life – whether you’re in the city or the great outdoors. For our own health and happiness as human beings, and ultimately for the respect and care we then give to the world around us.